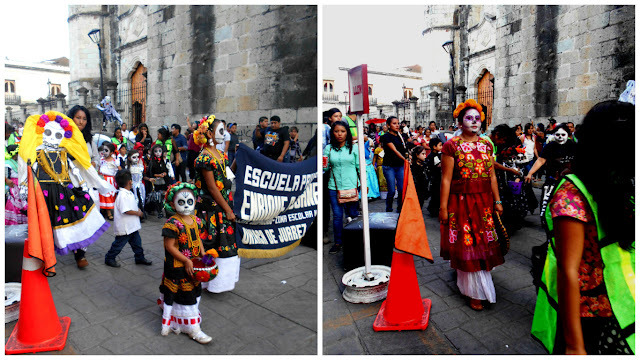 Our journey for Day of the Dead in Oaxaca City, Oaxaca, Mexico was a memorable one. In fact around sunset somewhere in a desert-like landscape we realised our bus driver was lost. We had no phone signal and the only person who knew we’d taken that particular bus was a relative who was now several hours in the other direction in Huatulco. We had hoped to reach Oaxaca City before nightfall but that was looking doubtful. I guess this became one of our first lessons in Latin America transport. Before I get back to the story of our journey to Oaxaca City I should give some context of our route through Mexico. We’d spend a full 5 weeks in Mexico starting in Cancun and crossing the Guatemalan border to Lake Atitlan. From the Yucatan area we flew to Mexico City and inland for a while before hitting the Pacific Coast. We had travelled some length of Mexico’s pacific coast and after some time in the surfing paradise of Puerto Escondido we spent a week in Huatulco. Huatulco is a small yet popular town on Mexico’s pacific coast line and popular with many American and Canadian tourists. During my time in Huatulco I was fortunate to stay with a relative of Jamie’s. We spent 7 lazy days enjoying Mexico’s finest in the heart of the Pacific Coast. From dolphin sightings on our 7-bay day tour to lazy afternoons around pool, every second spent in Huatulco was filled with fun. But, like with any destination, before we knew it our time of relaxation and rest in Huatulco was over. We visited Huatulco just before the end of October. Our route through Mexicowould take us to one final destination to experience Day of the Dead Oaxaca City style. On our final morning in Huatulco we booked a shuttle service to Oaxaca. We’d heard from locals that the winding roads were very dangerous and generally inaccessible for larger busses. Shuttles are favoured for this journey. The journey from Huatulco to Oaxaca City takes around 6/7 hours in a shuttle bus. The shuttle takes you directly up a sloping mountain range before heading back down to Oaxaca City. The roads are winding and tough for anyone who suffers with travel sickness, believe me. Like I mentioned earlier, at around sunset we began to realise our bus driver was lost. The driver had taken a few wrong turns. He was a little distracted and the roads didn’t really look like roads much. Eventually, our driver frantically called some friends and stopped some locals and we eventually arrived in Oaxaca City. This is something I later learnt can be expected throughout Latin America. Oaxaca City is located in central Mexico and often known as Oaxaca de Juárez. It is the capital city of the state of Oaxaca which is a large central state in Mexico. Oaxaca City is an extremely popular tourist destination within the central Mexican valley due to it’s rich culture and history. 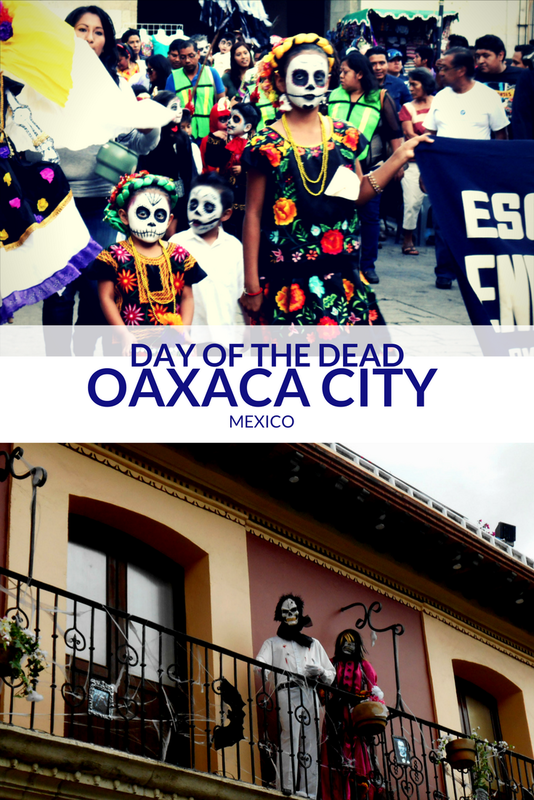 Oaxaca is known for it’s Mixtec and Zapotec history along with it’s close ties to Day of the Dead celebrations. Day of the Dead is widely celebrated in the state of Oaxaca. This is one of the reasons we timed our visit around this. Visiting the markets: The markets of Oaxaca are incredible and we actually chose to visit one every single day during our time in the city. Whether you are hoping to buy souvenirs, grab a cheap meal or stock up on some dried chili you are in luck! Day of the Dead market stalls: Specifically, there are many Day of the Dead pop up stalls in Oaxaca City you can enjoy if you plan to experience Day of the Dead in Oaxaca. 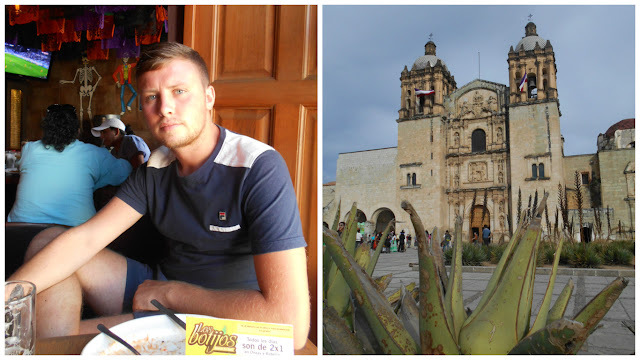 Oaxaca city tour: During our time in Oaxaca we also took a city tour. This ended up being completely in Spanish but was still a great experience seeing the main sites of the city with other tourists I would recommend. Check out Oaxaca Cathedral: One of the most breathtaking and must see things to do in Oaxaca City is check out Oaxaca Cathedral located in the centre of the city. Cafe culture: One of the best things to do in Oaxaca is enjoy the fun cafe culture and nightlife. There is always a party or a family run restaurant to check out. Often when drinking in bars you are served complimentary snacks too! Always a winner. Rooftop chills: There are a few hidden rooftop bars in Oaxaca. I’m virtually obsessed with drinking at altitude, so I’m always on the lookout for a rooftop spot to grab a drink. One of the things I loved the most about Oaxaca City is its cafe culture and nightlife. The actual nightlife in Oaxaca is fun, especially during late October and around Day of the Dead. Because the city is so busy there is lots going on and the streets and bars are packed. It’s pretty budget friendly to drink in Oaxaca City and beers and cocktails in most bars are reasonably priced. You can also grab a tequila or mezcal for cheap too – it’s a tradition in Mexico after all. We spent so much time exploring eateries and trying the various cuisine available in Oaxaca City. There is a wide range of traditional and fusion cuisine to try. Menu del Dias are plenty – which is a common budget favourite menu of the day option locals love. Most, if not all of the locally ran businesses are reasonably priced and the food is filling and tasty. Expect to eat rice, beans and meat or usually something else for veggies usually pasta. Most set meals come with a drink and even sometimes a desert. Whilst in Oaxaca were even able to visit a traditional Mezcaleria. We were able to sample some Mezcal, something the region is well know for. We only had small samples but the contents literally blew our heads off! 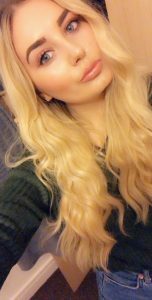 Its pretty fiery. Sampling the Mezcal is something so many people suggested to do whilst in Oaxaca City, a stronger version of Tequila from the Agave plant. If you are spending Day of the Dead in Oaxaca City don’t worry. 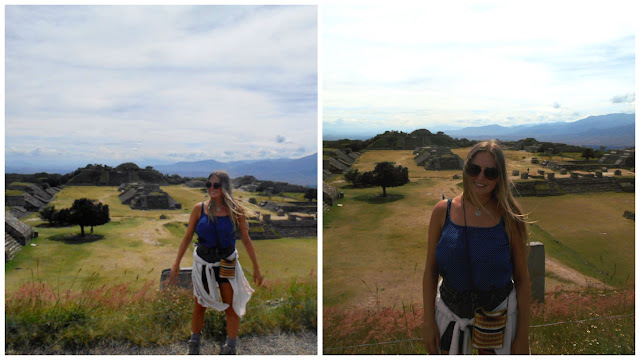 There are still plenty of incredible things to do, this includes a day trip to Monte Alban. Monte Alban is a popular a pre-Columbian archaeological site just outside of the city. Monte Alban was the final archaeological site we would visit in Mexico. We has seen the pyramids of Cholula and more well-known Chichen Itza and a couple of others inbetween. It’s very easy to get to Monte Alban from the main city. Several busses leave from several shuttle organisations just off the main streets. The bus takes approximately 30 minutes. You can visit Monte Alban from 8:00am but the site closes at 5:00pm. I have to say Monte Alban has the most breathtaking views. In the shuttle on the way to the site you seem to go up for what feels like a very long time. Upon reaching the summit you don’t realise how high up you are, until you see the views. The views are one of the main reasons Monte Alban is a must visit. Monte Alban is free of hustlers and people selling artifacts, which as annoys me a lot but comes part and parcel with travel. The site is quite small compared to others. We walked the site several times following the ancient paths and trying to follow the signs. It’s definitely worth the day trip and I would absolutely recommend visiting Monte Alban when in Oaxaca City. When we first arrived in Mexico we knew we’d be close to leaving by the time Day of the Dead came around. Oaxaca Day of the Dead traditions are something we knew about before arriving in Mexico. As the month of October grew shorter we began to see promotional material for Dia de los Muertos. This got us excited. The Day of the Dead celebrations were due to start on the 31st of October as they do every year and last until the 2nd of November. 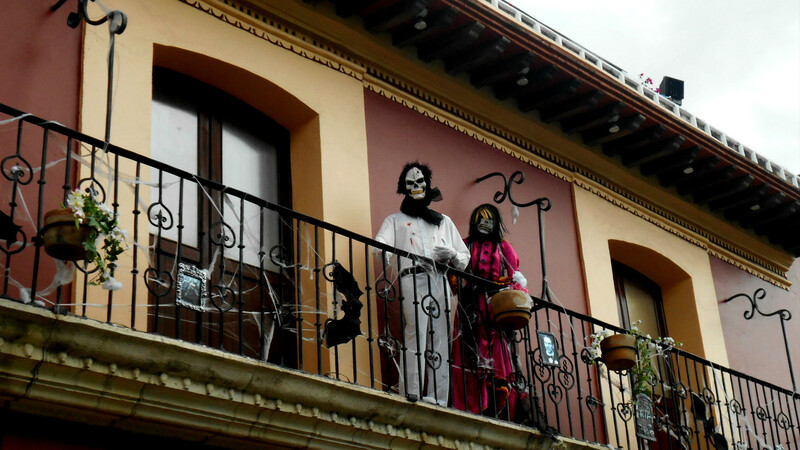 The Day of the Dead costumes and celebrations were in full swing when we arrived a few days ahead of the 31st October. Each day we spent in Oaxaca City was spend embracing the culture and festivities leading up to the main events of Day of the Dead. Oaxaca Day of the Dead celebrations are not unique but it is one of the largest sates to celebrate the tradition. During our time in Oaxaca City we began to see more and more costumes as the festival began. Dia de los Muertos consists of three key days. All Saints Eve, All Saints Day and All Souls Day. Another great addition to being in Oaxaca City during the Day of the Dead Festival and leading up to the celebrations are the amazing decorations. Each house and public space has its own range of Day of the Dead themed decorations. From marigolds and candles to skulls and coffins. Every day the streets are bustling and lively because of the large number of tourists packed into the city wanting to witness the festivities. As mentioned Oaxaca Day of the Dead traditions are not unique and happen in various towns and cities throughout Mexico. However, Dia de los Muertos is really the perfect time to visit Oaxaca City as Day of the Dead is as much as part of Oaxacan Culture as Oaxacan Culture is to it. You’ll often find Oaxaca State listed as one of the best places to experience the celebrations. During the Festival of the Dead we got to see so many parades, visit so many pop-up markets and see so much live music. Parades are often some of the best part of experiencing Day of the Dead in Oaxaca City. You’ll want to make sure you are in the main city centre around noon each day for when they start. There are so many Day of the Dead different performances in various locations throughout Oaxaca City from October 31st – November 2nd. The 3 days of festivities all stand for something different. We found ourselves in the crowds of many dance shows with traditional Mexican music playing out into the streets. The costumes are possibly my fave part! As part of our Oaxaca Day of the Dead experience, we spent Halloween (All Saints Eve) in a cemetery. We actually spent the evening with many Mexican locals in the famous San Miguel Cemetery of Oaxaca City. San Miguel Cemetery is famed for its Day of the Dead celebrations. Being around people filled with nothing but joy because of their respect for death as a ‘rite of passage’ really helped me understand Day of the Dead. It only took a small amount of wandering the cemetery and trying to remain respectful before I began to realise that nobody cared if I was. Locals were dressed in Day of the Dead costumes. Most families celebrated late into the night in the Oaxacan cemetery. Being in San Miguel Cemetery with the residents of Oaxaca City opened my eyes to a new cultural understanding of Mexico. Orange marigolds are the official flower of the dead and you should expect to see them during your time in Oaxaca City. Before entering San Miguel Cemetery you’ll pass multiple stalls selling marigolds if you want to buy some. Along with marigolds, expect to see food vendors and amusements also. There is practically a small carnival which lines the outer walls of San Miguel Cemetery in Oaxaca City. Honoring the dead and death as a rite of passage means something especially different to Mexicans than what it does to my culture. It was an incredible feeling to be part of something in San Miguel Cemetery that was so distant to my own cultures ideologies about death and the purpose of a cemetery. As a stranger I felt so welcome in Oaxaca City. It’s such a captivating place to be and the locals only add to that. We got to witness some fabulous weddings with celebrations spilling out into the midday sun whilst in the city. This made me feel really part of Oaxaca. Everything you experience is so energetic and that energy is infectious. I felt so at home in Oaxaca City. I certainly believe I’d have this feeling no matter what time of year I visited. Oaxaca City is a gem of Mexico and a must visit! My hubby is Oaxaceño and I've visited Oaxaca multiple times, unfortunately not for Day of the dead. Decorations and "katrinas" look amazing, I can't wait until I see it in person! Such a great experience. Really left us feeling like we had seen a lot of the best Mexico has to offer. Such an incredible country, I hope to see it again soon. Yes, you must! The celebrations and decorations are spectacular. I'm so excited, I'm going to Mexico this year and cannot wait to experience all the culture & the celebrations for day of the dead! You're so lucky! I know you'll have such an amazing time! Mexico is a truly welcoming country with so much culture and history. 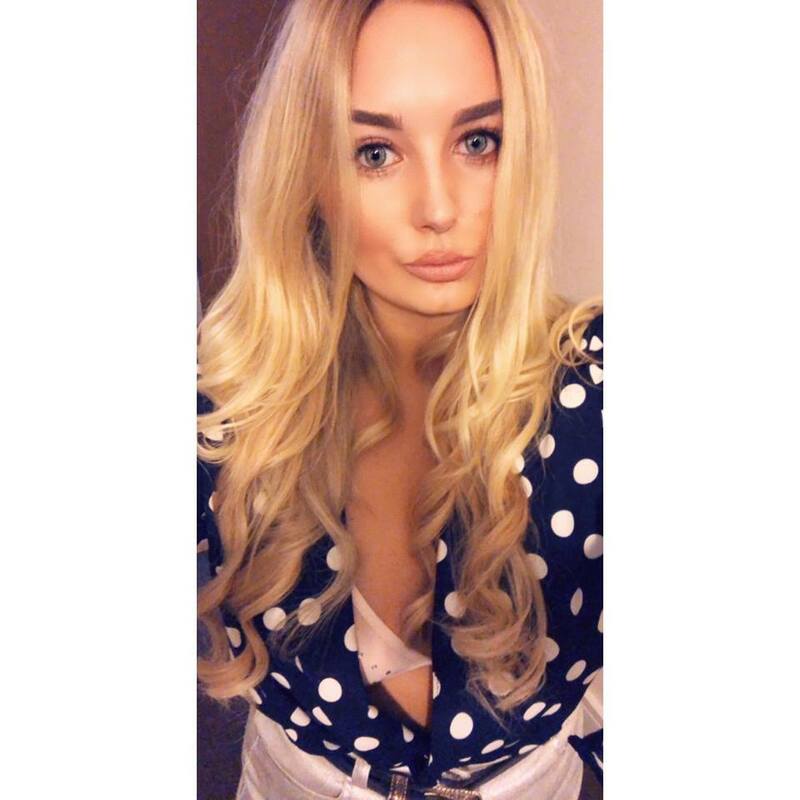 I'm jealous have the best time.